Built by A. Tarkhanian, S. Khachikyan, G. Pogosyan and G. Mushegyan. Opened 31 Oc 1983 as "Sports and Concerts Complex". The complex includes the Sports Hall (8008 seats) and the Concert Hall (2008 seats). 1985 damages by fire, 1985-1987 renovations. 2005-2008 renovations. 1999 renamed in honour of the Soviet/Armenian politician, Karen Demirchyan (1932-1999). 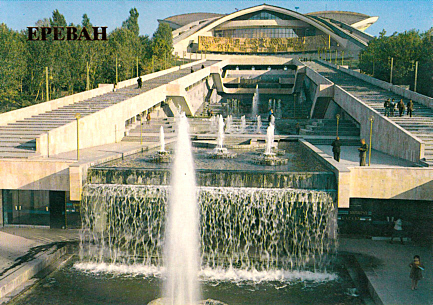 Since then, known as "Karen Demirchyan Sports and Concerts Complex", "Demirchyan Arena, Sports & Music Complex", or simply "Hamalir" (for "complex" in Armenian). Reverse Text: "Yerevan. Sportivno-konzertny kompleks; Yerevan. Sports and Concerts Complex"